Well, I am off to work! Hopefully I will be able to start the read-a-thon later today by squeezing in one book between getting off of work and finishing my homework. 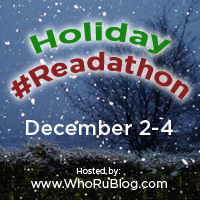 I would really love to read The Running Dream by Wendelin van Draanen today! That will be book #3 in my White Christmas (white covers) December feature. I managed to fit in some reading before and after work, but then I really had to do that pesky homework. Now I'm finally sitting down to some uninterrupted reading time!